– Golden Edge by Carlos Resende (an image of the pool at Azenhas do Mar in Portugal). 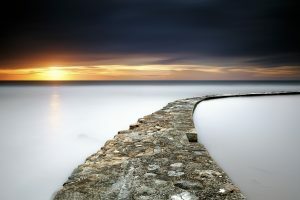 – Pool by Carlos Resende (another image of the pool at Azenhas do Mar in Portugal). 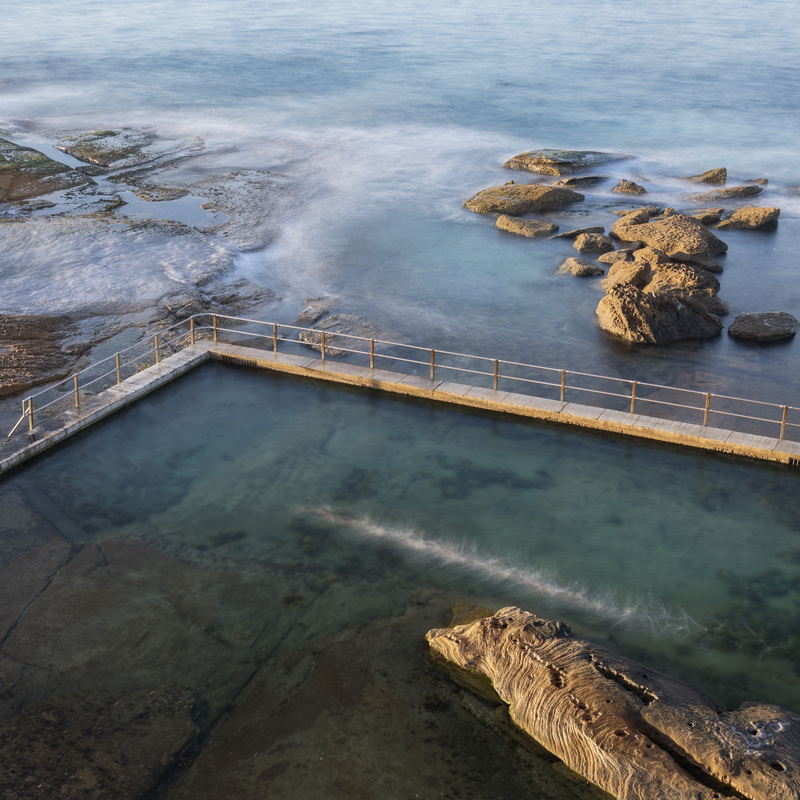 Our judges awarded Special Commendations to Rosie Steggles and Graham Gall, who each submitted 5 fine images of ocean pools. 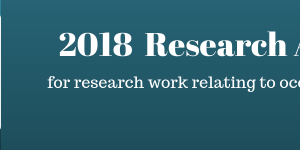 All into Ocean Pools Inc congratulates all our award winners and thanks all of the award entrants and our judges (Julianne Collingridge and Barbara Smith) for their participation in the 2018 Sheridan Evans Award for artwork relating to ocean pools. 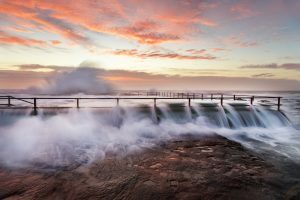 Who built the ocean pools around Sydney? 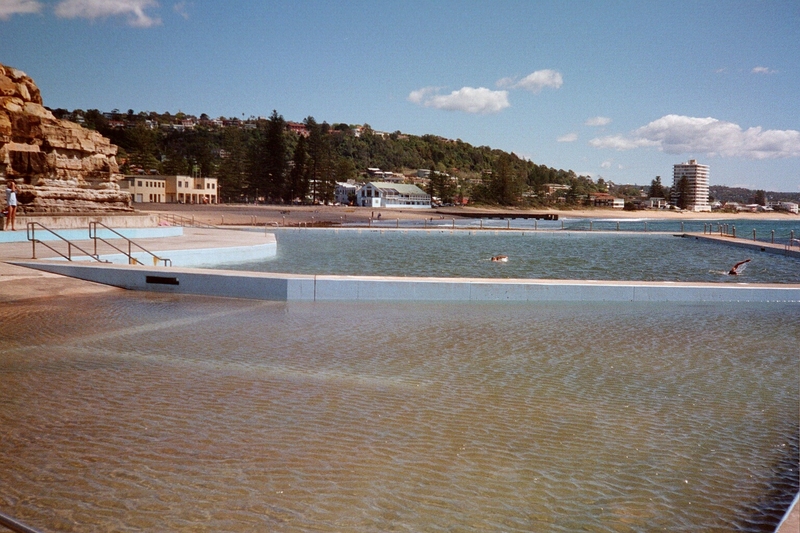 Why are no new ocean pools being built in present day? Sue Daniel, digital producer for ABC NSW News, contacted our Chairperson, Marie-Louise McDermott, for help in addressing those questions and invited her to be take part in an ABC Radio Sydney broadcast segment about Sydney’s ocean pools. Announcing the joint winners for our 2016 art award! 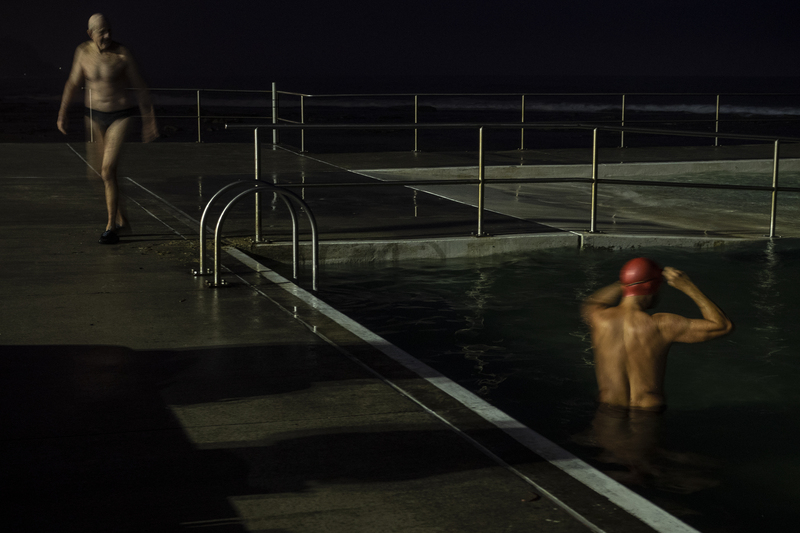 $500 goes to Lizzie Buckmaster Dove for her images of sculptures from her ‘Alchemy of Blue‘ project. 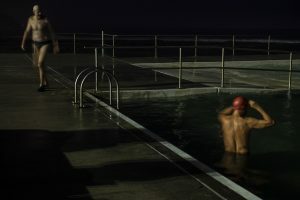 Using concrete pieces of the Coledale ocean pool that she had found on her daily beach walks or extracted during the pool’s 2011 renovation, this artist created works that spoke of rock, tide, time, gravity and the lightness of being in water. Diverse Productions Pty Ltd, the Perth-based firm sponsoring the 2015/2016 Sheridan Evans Award. 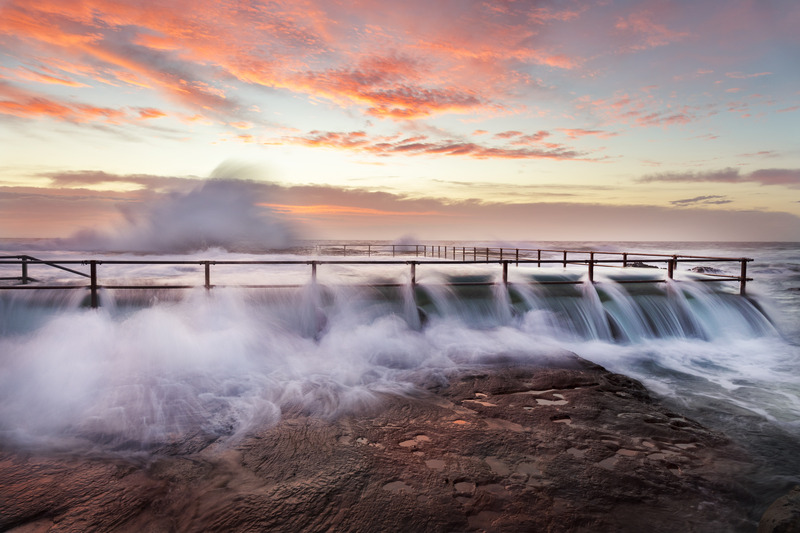 Entrants for this inaugural Sheridan Evans Award had to submit original work produced in a digital format prior to 15 June 2016 and relating to one or more of the Australian ocean pools listed on the All into Ocean Pools Inc website. There were no entry charges and no limits on the number of entries that a person or group could submit. 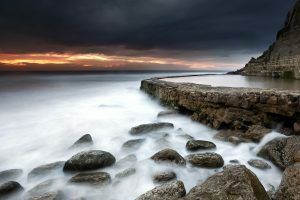 All into Ocean Pools Inc hopes future Sheridan Evans Awards will attract an even wider range of entries including some that feature music and dance, some entries depicting ocean pools in wild and stormy moods as well as others depicting ocean pools as happy, sunny, romantic or mysterious places. Entries for the 2017 Sheridan Evans Award can relate to any of the ocean pools listed on the All into Ocean Pools Inc website (Australasian ocean pools, South African ocean pools, American ocean pools, European ocean pools). Keep checking this website for further details. Sited at the southern end of Collaroy Beach. 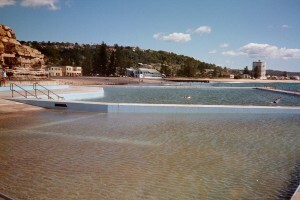 A classic ocean pool with chains. Pool complex of two interconnecting pools, namely a 50-metre pool and a smaller wading pool. Both irregularly shaped and sited to follow the curve of the nearby low-level rock face. Concrete promenade. This pool is a popular subject for photographers.